Your priceless photos, slides and memorabilia are important to me and helping tell your family’s story is my top priority. Your printed photos can be sorted and organized for your enjoyment, sharing and future legacy. Organizing services may include sorting, removal from albums, and notating details for digitizing. After your photos are organized, they should then be digitized, archived and secured. Loose photos are scanned as a .jpg at 600 dpi (1600 for slides). Scanning of your photo collection is charged on an hourly basis. I do track the numbers of items digitized - but clients will be charged an hourly rate for the digitizing of their collections. Some slides may come to me damaged or warped, due to age, humidity, water, etc. – I will do my best to get the best scan possible of your slide. Pages are scanned at .jpg at 600 dpi. Albums & Scrapbook pages are scanned as an “entire page”. Removal of photos from albums and sorting will be charged at the hourly fee. 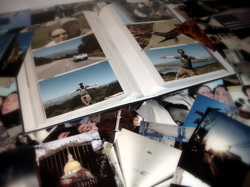 Scrapbooks and Photo Albums may have unique challenges (age, construction of book, condition of book) which can increase the time needed for scanning. Memorabilia pieces are some of the most difficult to digitize. They aren't typically a standard size and they can't be fed through typical scanner rollers. Some documents, certificates, art pieces, etc. require multiple scans and "stitching" together of the scans, to make a cohesive digital image. Clients will receive their digitized images on a USB flashdrive as part of the job. Files will be stored digitally at Creating Memories Now for 90 days after completion of job - please contact me if you need additional copies of your files or output prior to the end of the 90-day window. Output of digital files to additional storage devices (DVD, External Hard Drive, other flash drives) will incur an additional fee (depending on item used) as well as applicable hourly fees for the setup and completion of the output. Archival boxes, files and other storage solutions (for your now-sorted photo collection) are also available, depending on your needs and end-goals. Ask about pricing. I can help you with your digital "mess" and help you organize it. Once your photos are organized digitally, I can help you with printed photo books or other photo gifts (calendars, videos) for sharing and enjoying. I use an outside company for conversion of film and tapes. I have full confidence in this vendor - they've done my own films and tapes in top-notch fashion. All items are tracked to and from my studio. Tapes and Reels average from $25-35 per reel for conversion. These items will be billed back to the client based on the vendor's charges. All vendors are required to abide by copyright laws, film reels and tapes that are of a commercial nature (studio movies, etc.) can not be converted. All scanning projects, large or small, have their own unique characteristics, needs and challenges. Each is a custom project, based on your requested goals and final product needs. Initial quotes and length of time estimated for a job is a guideline based on the assessment we will do (determining the scope of the project) prior to starting the job. Unique situations or challenges may arise during each project ** I will keep you informed of possible and probable outcomes and any changes in pricing due to those challenges. I will use best-practices available to me with your photo collection and will handle your photos, memorabilia and slides with care. Scanning services do not include photo restoration or repair -- Photo Restoration of photos and slides will be priced on a per-piece bases, depending on restoration services needed. Projects can be long-term or short-term – some are accomplished over the course of days, weeks or sometimes months. Let's map out your needs and where to start, based on your goals. Gather your photos and thoughts and contact me to schedule a free 30-minute consultation so that we can better determine the scope of your photo archives and needs.